Been doing art all day, gearing up for all the TV shows looming on the horizon. If I tell you what’s when now, then you will know what’s when then! I’ve suddenly come over all limp. So much for slowing down, taking my foot of the accelerator! Ah well. One day at a time, eh…And to be really honest, it is the TV shows which define us, which put us on your radar, which have put us on the map! I don’t take TV for granted. It was offered to us many years ago; it was a Golden Opportunity which we embraced – and still do. We never tire of doing our very best, and it seems to be working well! Long may it continue. So come on Gray! Time to smile and have an attitude of gratitude! There are a few Golden Open Acrylics which – if I may say so, are fantastic to work with. We only stock a handful of them, because they are quite expensive, and I have figured out which ones I think we NEED! When you combine these particular colours, you can get the most spectacular blends. 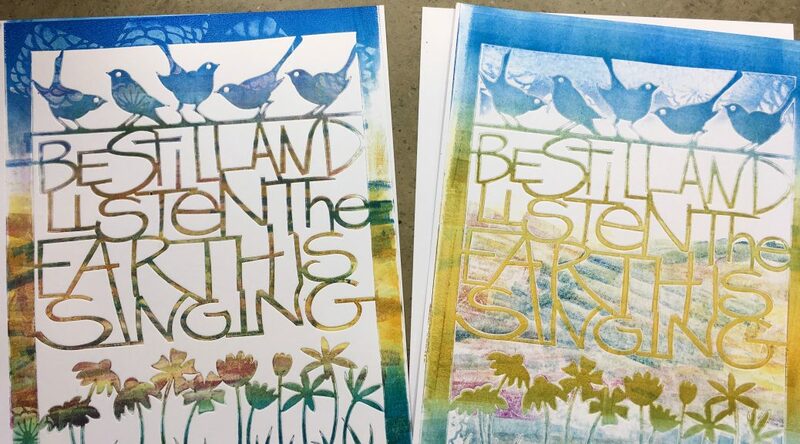 I had a little play this afternoon, using some rather super A4 stencils too. Ready for a guided tour? First colour: Quinacridone Nickel Azo Gold. Place the A4 Stencil face down on the 8×10 inch Gelpress. 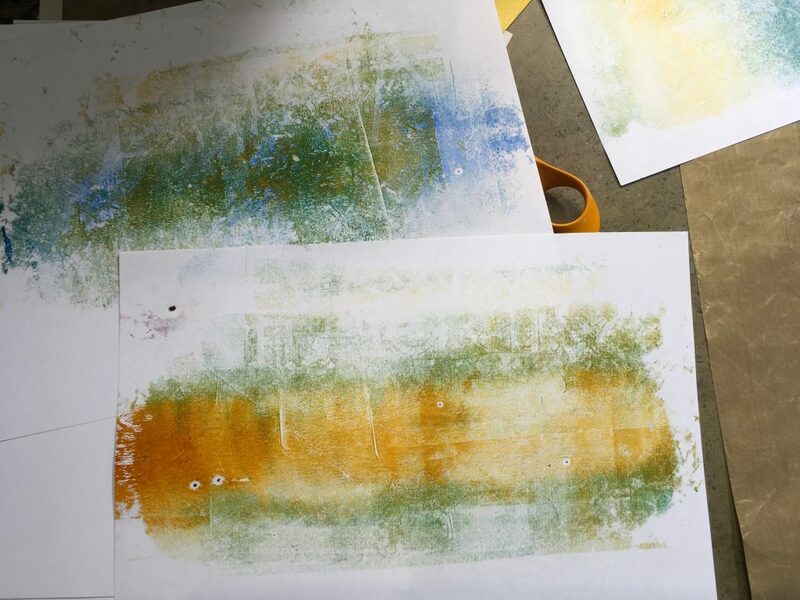 Brayer the Golden Open Gold through the centre. 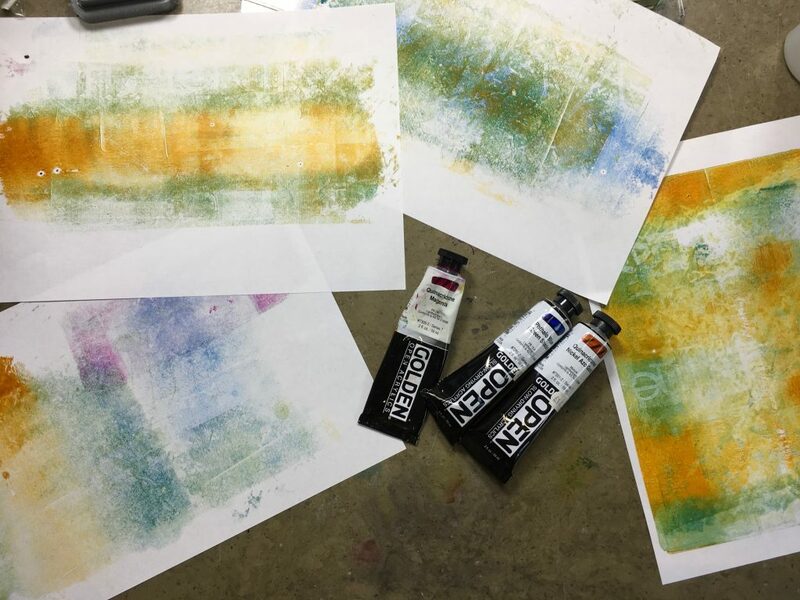 Clean off your brayer before adding Phthalo Blue top and bottom. Where the blue overlaps the yellow, lovely greens ensue. This paint is a slow drying oily acrylic. Blimming fantabulous. 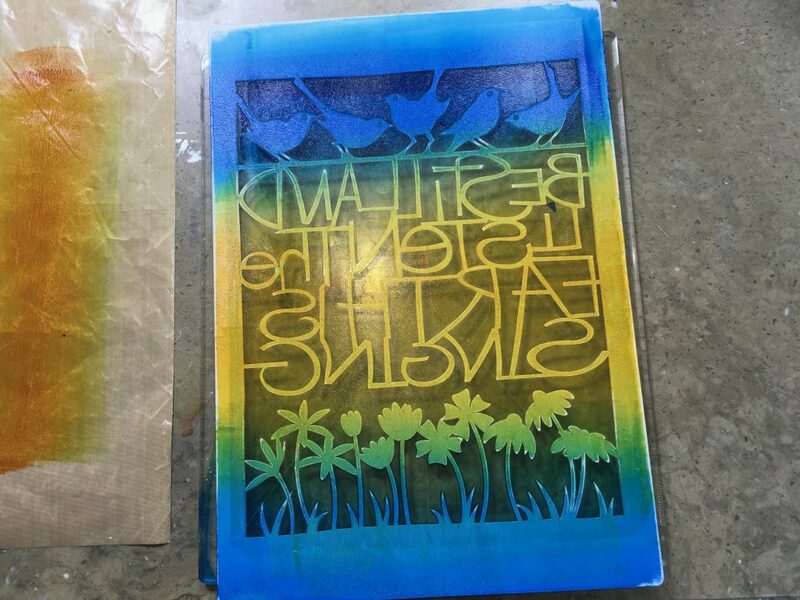 Lift the painty stencil off the Gelpress. We have got two paths to follow now, and as the paint is a slow dryer, we don’t have to rush at all at all. Let’s go with the stencil first, which is covered with paint. 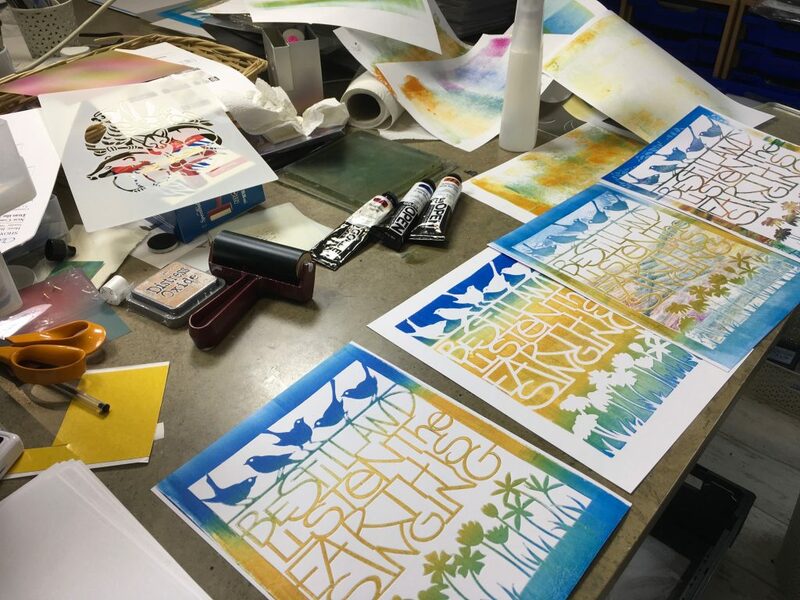 Run it through a mangle (err… Die cutting machine eg Gemini). 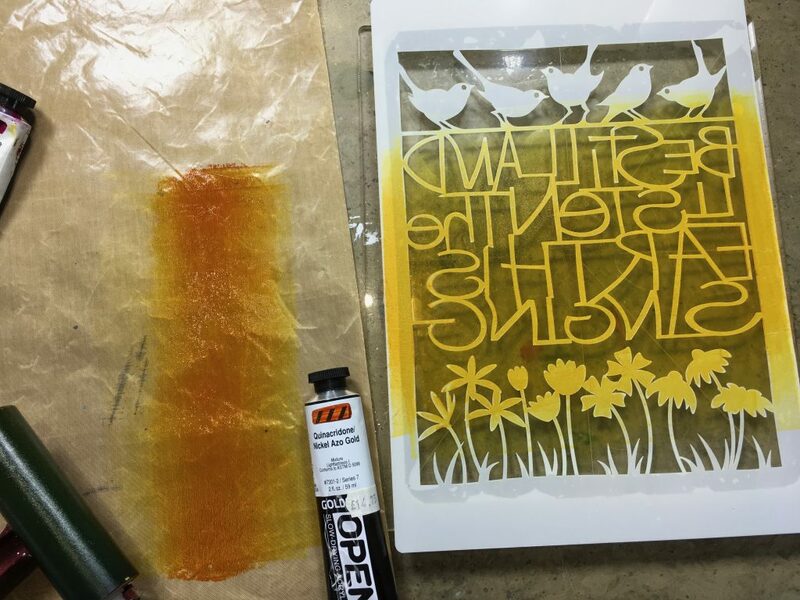 See how perfectly the paint transfers from the stencil to the card? NICE!! So we have both a positive and a negative print. Shall we keep going? See what else we can discover? Right. Repeat the same steps as for the above, but before we lift the stencil off the Gelpress, let’s try a couple of tricks. 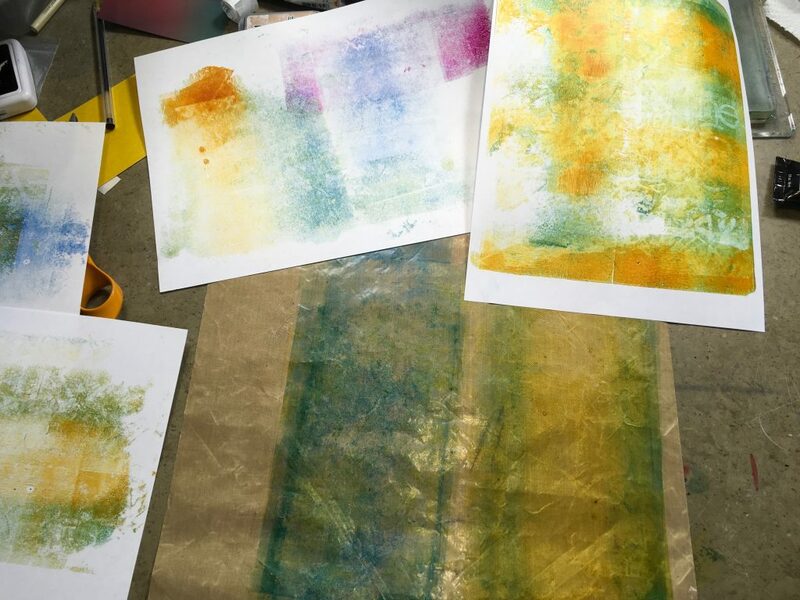 Roll the brayer in the paints on the craft mat and then pounce it over the artwork through the yellow area on the Gelpress. Bounce it. I was thinking fields and hills. 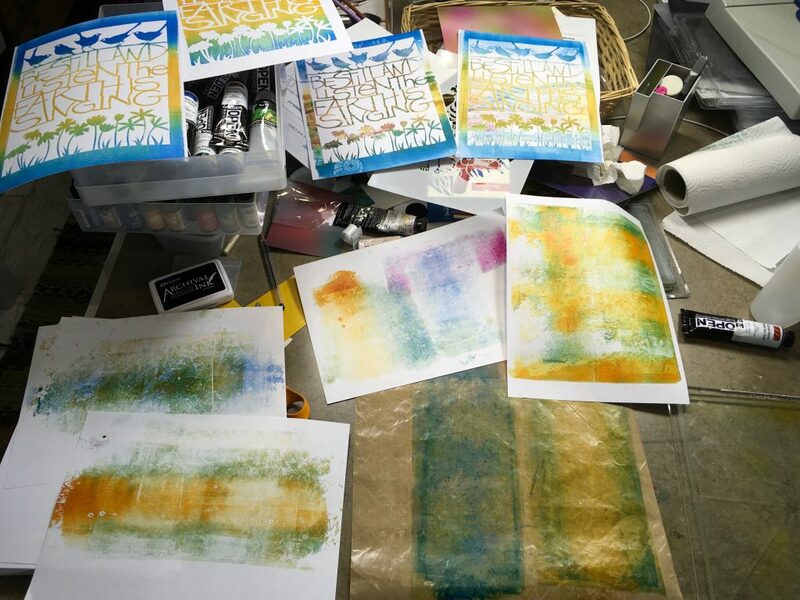 What’s great is that you are grunging up the stencil colours too. So when you lift the stencil off, you have mushed up the colours in the background AND on the stencil. See the difference? 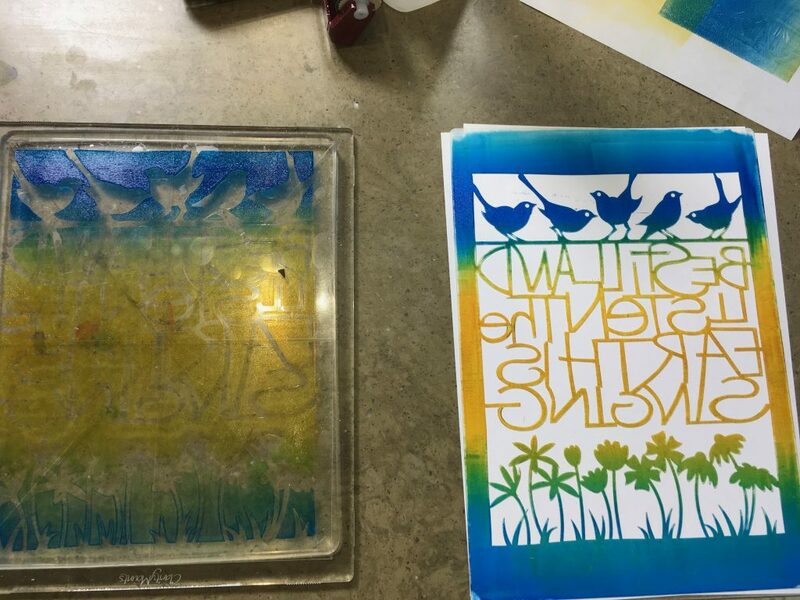 See how you can lift this paint off the Gelpress beautifully with a stamp too? I could go on, but that’ll do. This paint is the one which gives the absolute most deluxe scraps too. Look! You know you will be seeing these in art over the next couple of weeks! What a stash! 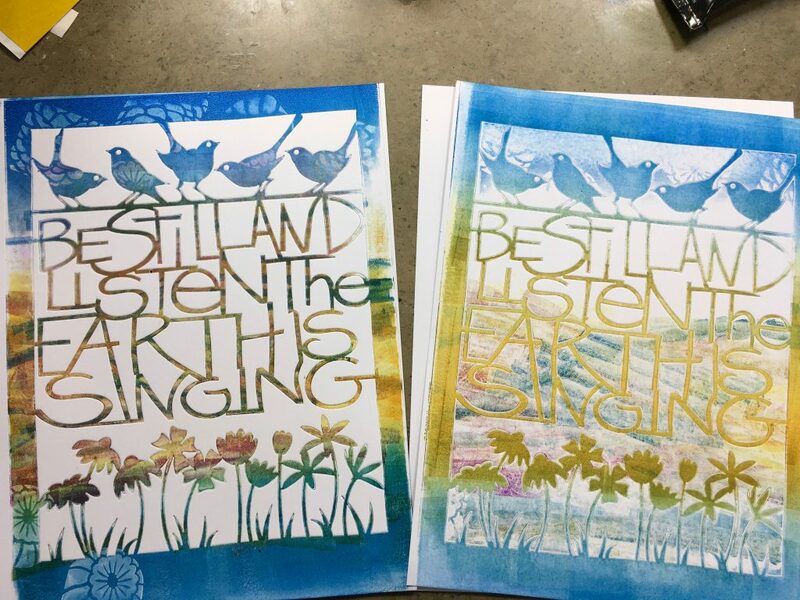 And just by laying a sheet of copy paper over the leftover paint on the craft mat! 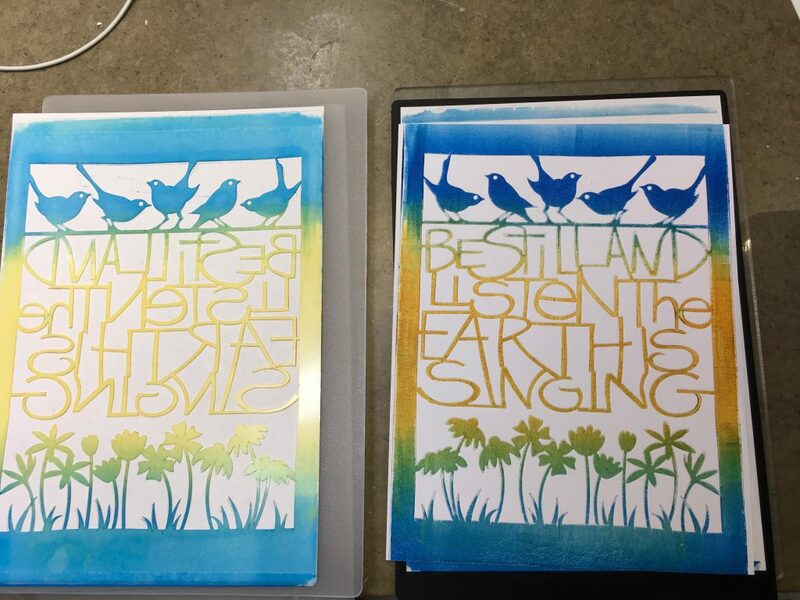 These three -Magenta, Phthalo Blue and Nickel Azo Gold plus the Paynes Gray. Those are the four I highly recommend. A little goes a long way with these, too.These tubes will last an age. And the stencils. Well they are pretty deluxe too. There are three in this collection in A4. Mel drew these. I think they would make superb stamps, dies and stamps too, don’t you?! 5 years. Is it time to stop? Not yet!!! Another skill to try. 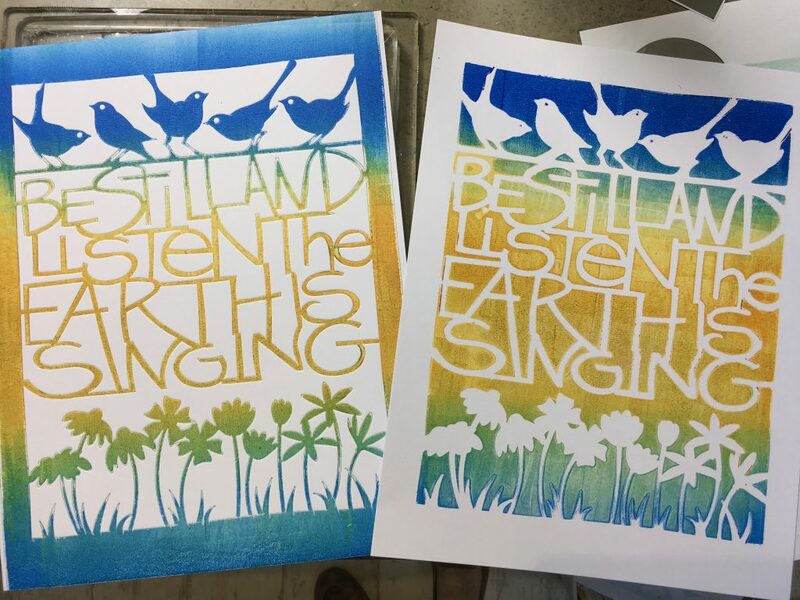 I have a couple of these stencils so will give it a go when I have space to get messy. At the moment it is all parching and die cutting. Have put all the dates in my diary but will record the Sunday shows as it is hubby’s birthday and we will be celebrating. Will not be able to get to the NEC this year but will watch on Hochanda. Did you go back to check on your pot? Looking forward to seeing the final result. Evening Barbara. Loving the artwork and yes I need to have a play with these stencils. Those paints look great too! Those designs would be brill as stamps and dies. Fingers crossed!!!! I do hope you get to relax a little in the run up to all these TV shows, not to mention the NEC and the trip to Germany!!! Try saying that ‘what, when’ line after a couple of sherries! You are certainly going to be busy and I am looking forward to seeing the Clarity team at the NEC. I have been saving my pennies for some lovely Groovi treats. Beautiful artwork from you, as usual. Not something I do myself, but I do admire those who do and produce such masterpieces. What day are you going Annette? I would really enjoy chatting to another follower of Barbara’s blog. Not an easy thing to cope with. My thoughts are with you and we hope that there are better times to come. Am thinking of you both, Gilly. As the others say, take things one day at a time. I must get my Gel Press out. 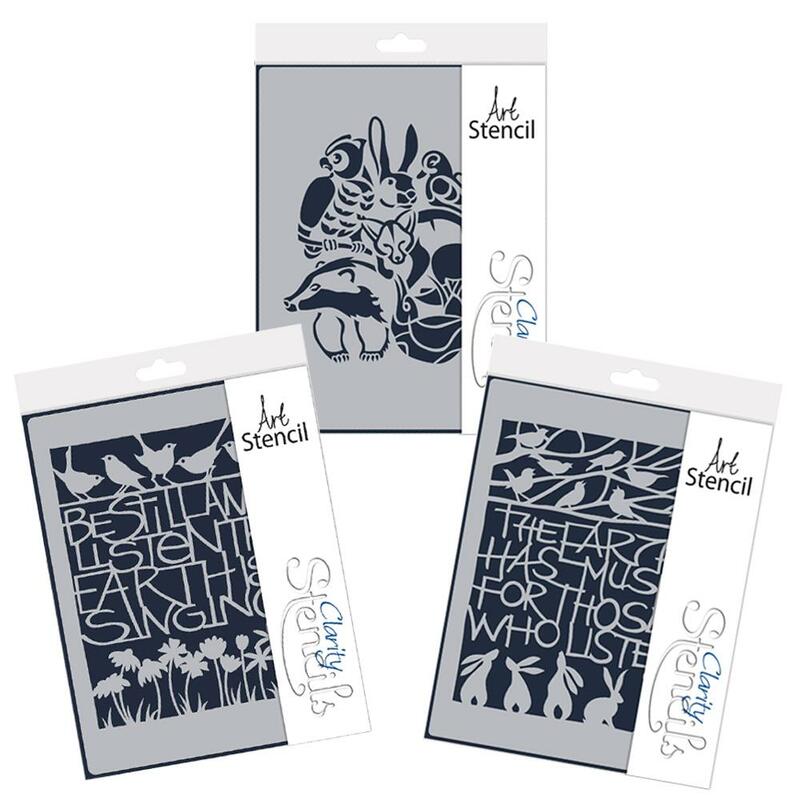 I have the small version of the stencils and just the Paynes Grey paint. I think I had better treat myself to the others. Golden artists products are excellent quality. Your art is always an inspiration. Looking forward to the NEC. I absolutely adore these stencils. I can never make up my mind which size to buy. But I have made up my mind that the stencils will be my purchase for this month. I adore the paints that you have used, but they will have to wait for another time. I did win an acrylic paint at the Crowborough Open Day, so at least I have one!! I will just have to have an all blue picture!! Your artwork is so inspiring. These are lovely Barbara. 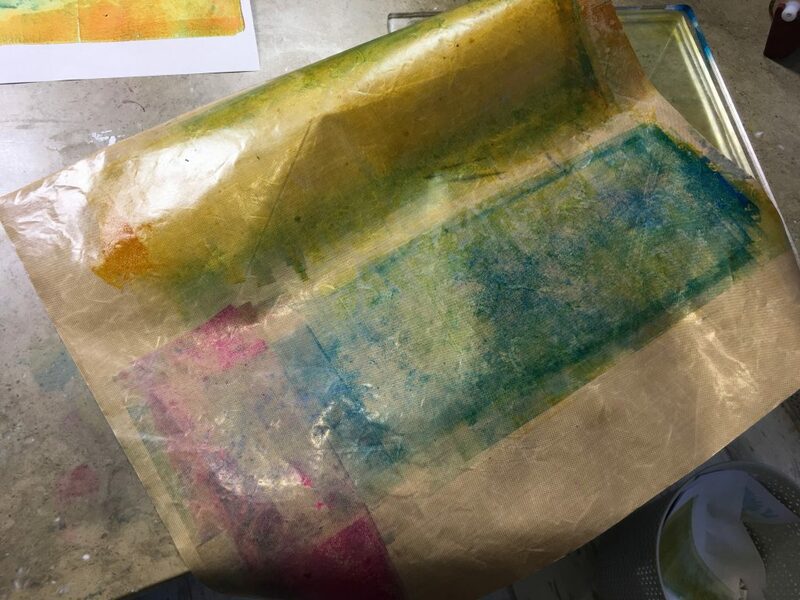 I don’t use my Gelli plate very much but am now thinking I could brayer with one hand – I can feel another crafty day coming on to try it! Thats stunning Barbara. 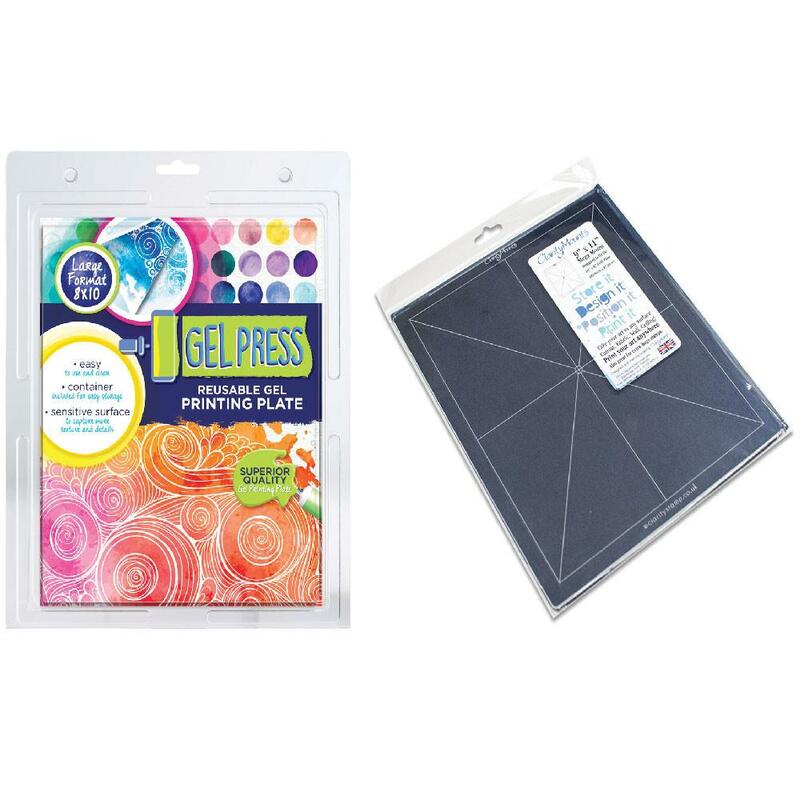 I love these stencils and have recently invested in a gel plate but haven’t plucked up the courage to use it yet. Will definitely do so now. You asked.. I think they would make superb stamps, dies and stamps too, don’t you? !